Tattoos for Summer 2013 by Maybelline! One of the many consequences of beauty blogging is hunting down collections that were never released in your country. Case in point, the Maybelline Color Tattoo Limited Edition range for the Summer of 2013. Now, I'm not 100% sure just how limited edition these were, but I believe that only the U.S. got the full 8 shade range, while Canada a selected few (as for this side of the pond, I don't think these ever hit any European Maybelline stands). 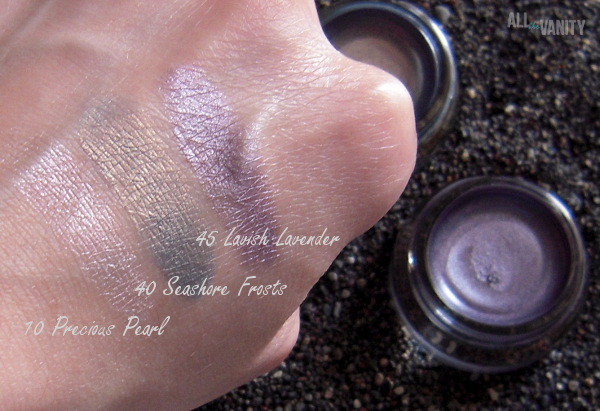 10 Precious Pearl, 40 Seashore Frosts and 45 Lavish Lavender. I didn't notice any creasing, despite my hooded eyelids and the mini heatwave that these were put through, they did, however, fade a bit over time. 10 Precious Pearl is a pink toned silky pearl shade, shot with silver glitter. Though it's a lovely shade, it's unfortunately the sheerest of the bunch, and it seems to set a little weird on the skin. I only used this just as an accent shade, so I didn't notice any issues while wearing it that way. 40 Seashore Frosts is probably the standout shade of this range, a grey-ish blue/tarnished gold duochrome, quite a rare find in the beauty world I think. It does not contain any glitter and it applies more evenly than the other two. It still fades a bit, but I find the uniqueness of the shade makes up for that! 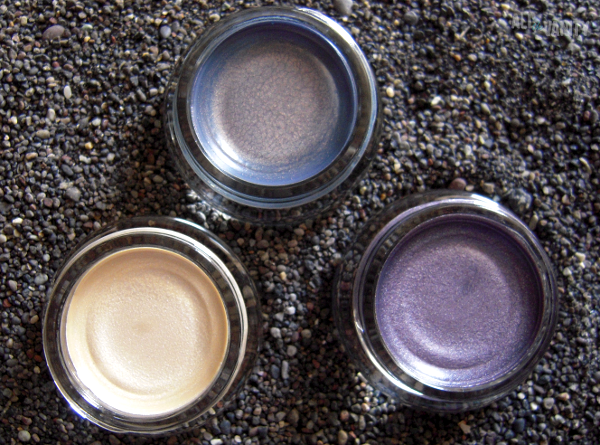 45 Lavish Lavender is a light purple lilac shade, infused with silver glitter particles. My problem with this one, is that it applies streaky, so you need to work with it a bit. The shade, however is gorgeous, I pair this with some smudged eyeliner and it makes for a beautiful nighttime look! My favorite way of applying these is with my fingers, I feel that I get a much more even result that way. And while the formula isn't up to par with the original, I don't think these were so bad - I plan to use mine for some easy and fuss-free summer looks. Then again, these didn't crease on me, so I might be luckier than others in that respect. 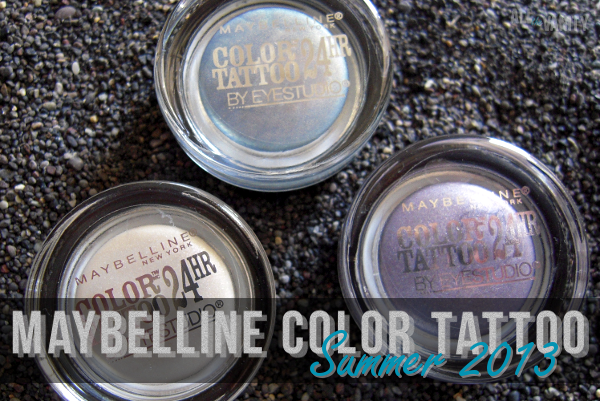 Have you tried Maybelline's Color Tattoo Limited Edition Summer 2013 range? Seashore frosts come to me - running like crazy to eBay! @ScrapgalGR: Hahahahaha, well, duochromes always have that exact effect on me too!!! At first I was like Precious Pearl looks so summery, but than I loved Seashore!! ;) you are just making my list huge doll!! Impromptu The Body Shop haul! Casual Denim OOTD (Sammydress jeans)! Out with Google Reader, In with Bloglovin! Haus of Gloi: Summer 2013 release!!! June Cherrybox Review (Cherrybox Ιουνίου)! In body oils we trust: my current body oil picks!